Play, sing, cavort or just watch and marvel when the Open Mic returns to the White Lion, Heptonstall on Friday, December 23rd, at 8.30pm. Performers of all kinds are wanted, including singers, poets, instrumentalists, jugglers and ice sculptors. Organiser Geoff says: “We have a lot of regular acts but we welcome new performers with open arms. 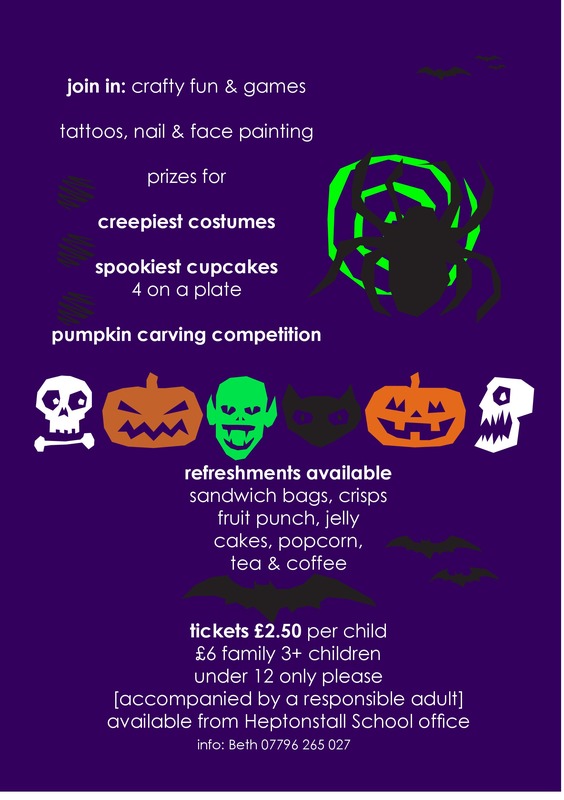 If you fancy a go, come along. We will guarantee you will get a slot and an enthusiastic and appreciative response. If you want to discuss further, call him on 01422 842629. Following the Consultation Exercise carried out in November 2016 the Parish Council has decided not to proceed further with a possible new car park on Valley View Road due to lack of community support. All households in the Parish of Heptonstall received details of the proposed scheme together with a questionnaire designed to establish the level of support for it. Some 42% of you returned the questionnaires (47% in the Village) but fewer than 50% were in favour of proceeding (46% in the Village and 43% in the Parish as a whole). Although 74% of you thought that Heptonstall Village needed additional off-street parking and 57% of you thought that the proposed lay-by would make a worthwhile addition, only 43% and 45% of you respectively thought the proposed scheme would deliver Value for Money and were willing to pay extra Council Tax to finance it. You the Community “have had your say” and have come out clearly against proceeding with the scheme, the Parish Council and Traffic Group have accordingly closed down the Project. We will however continue to maintain what pressure we can on Calderdale Council to maintain and improve car parking facilities in the Village and the rest of the Parish. The Parish Council planning meeting tonight (Wednesday 15 June) will begin as planned outside Stone Slack, near Drapers Corner, at 7.30pm but will move to Green Slack house, just behind Drapers Corner, if a longer discussion is needed. The first item on the agenda is plans for two houses to be built on the empty land near Stone Slack. The meeting will continue with discussion about changes to the Heptonstall Methodist Chapel as detailed below. Members of the public may attend. Comments are invited on plans for a new kitchen, toilets and meeting room in Heptonstall Methodist Chapel as part of plans to dispose of the Sunday School, and create modern facilities in the chapel. The public consultation is being organised through the central Methodist Church. Listed building consent has been applied for to the central Methodist Church because they deal with applications through the Ecclesiastical Exemptions Act, instead of Calderdale Council. The kitchen and toilets would be in the vestry and storage rooms at the back of the church. Pews would be removed on either side of the pulpit to create a servery area and exhibition space on either side of the pulpit. Pews between the two entrance doors would be removed to make space to build a meeting room. Repairs to the roof are also planned. The parish council has been invited to comment, and will be discussing the plans as part of a planning meeting outside Stone Slack at 7.30pm on Wednesday, June 15. The public are invited to attend. English Heritage, the Victorian Society, the Ancient Monuments Society and others have also been invited to comment. The Egyptian King’s slaves keep him dry. Not a jest! Ah he’s safe from the floods, he’s found an old life vest! Good Friday! 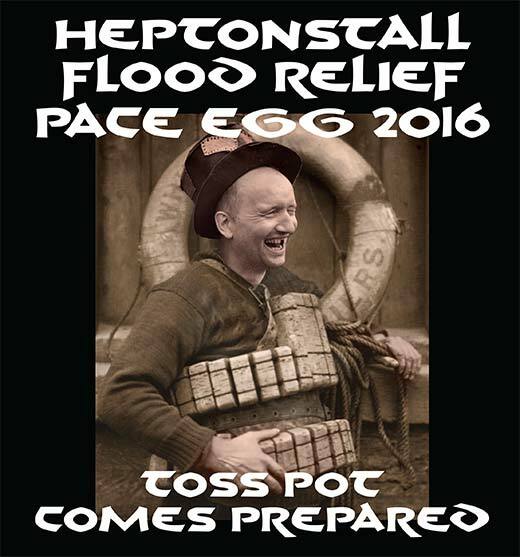 The Pace Egg! Make Heptonstall your dest…..(ination)! With thanks to Andy Carter for the words and Frank Sutcliffe for the original photograph. This year we will be collecting for the: Community Foundation for Calderdale Flood Relief Fund and East African Playgrounds project to build safe play areas for village children in East Africa. Please come by foot or public transport. Parking in the village is very limited. 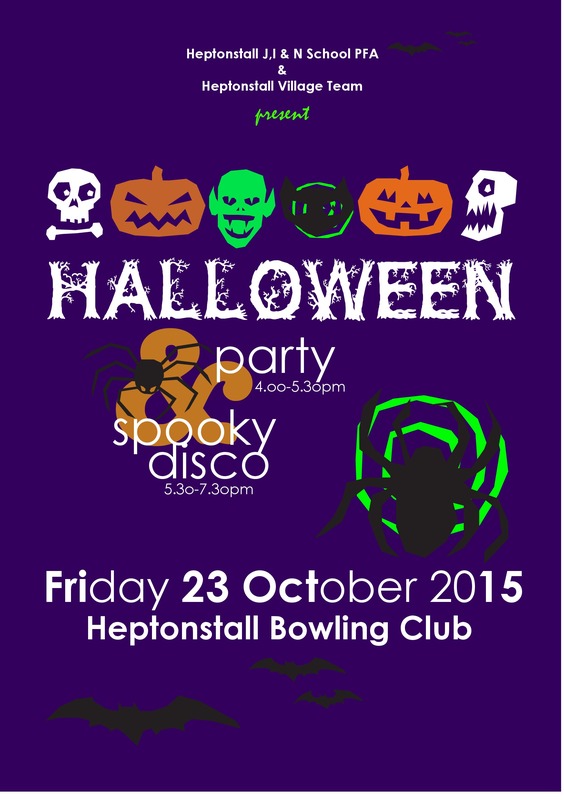 Don’t forget to get your pumpkins ready for the Hallowe’en party and disco at the Bowling Club on Friday 23 October.